The thing that got me into Flash many many years ago is learning how to make things move using code. 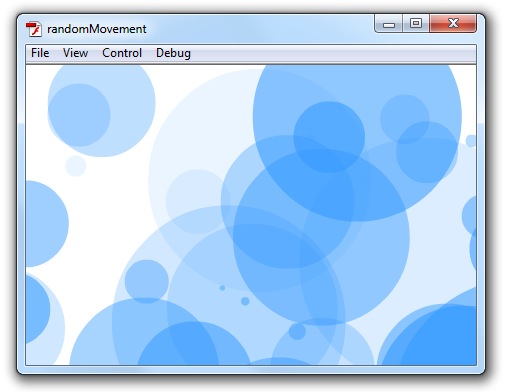 One of the first things I ever did was have circles move around the screen...randomly. Random movement is fun because it isn't boring. Unlike animations where things move in a pre-defined fashion, the technique you will learn in this deconstruction article will help you create animations that are more life-like and unpredictable. 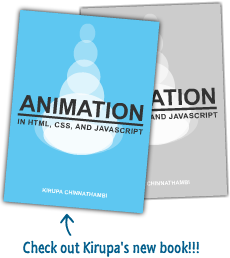 While you won't be creating an application from scratch, you will still learn some interesting details on how to make things animate to a random destination using nothing but a single movie clip and less than 100 lines of code. 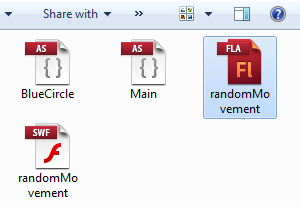 Launch Flash CS5 and go ahead and open randomMovement.fla (or randomMovementCS4.fla if you are using Flash CS4) and the two AS files BlueCircle and Main. Once you have done this, you have an exact copy of the application whose output you saw happily moving around earlier. You should see on your Flash player a replica of the randomly moving blue circles you saw earlier. At the very beginning, the application loads a blue circle that you had drawn and converted into a MovieClip. This MovieClip has a class associated with it, and that class is called BlueCircle. What this means is that if you instantiate a BlueCircle object in code and add that to your stage, a lovely blue circle will greet you when you run your application. Getting the circles to display, and getting them to move are two separate things each handled in their own class file. Getting the circles to display is handled by Main.as, and the Main class is the document class for your Flash file. Once a BlueCircle object is added to your stage, everything from randomly positioning itself initially to moving to a random destination are specified entirely within the BlueCircle class. In the next few pages, let's take the above summary and dive much deeper into how exactly it was done.